To ensure good cycling techniques become habit and protect delicate youthful knees and tendons, BC rules limit what gear ratios under 16s may use in competitive events. IE: They aren't allowed to push too high (hard) a gear. We bought Daniel's Trek 1.1 bike, with a maximum ratio of 50x12 (Oops!). Dan was not thrilled with any changes that might limit his cycling power, of course. Youth E (under 8) - 5.10 metres. Leave front rings as they are, but limit the back rings available; youth riders often don't use full gear range, anyway. Not realistic, too many back cogs to block. Blocking out just the large ring at the front would leave Dan very undergeared. Replace just the largest chain ring, only for the duration needed (budget solution?). It's likely that the smallest back cog(s) would need to be permanently blocked (for racing purposes). Replace the largest chain ring and block one or more of the rear cogs, but only blocked for the duration needed (allow more range as child ages). Replace both the largest chain ring with something a bit smaller, and the sprocket with a junior block. This is a popular solution. 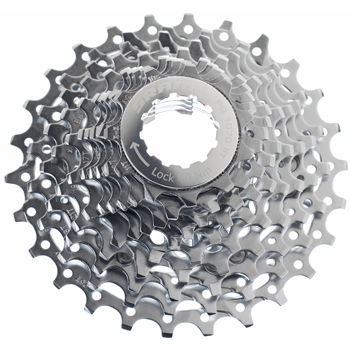 So Dan could have 33-44 chain rings with 7 speed 14-25 sprocket, resulting in gear lengths= 2.88, 3, 3.28, (3.85), 4.01, 4.01, 4.37, 4.51, 4.81, (5.15), 5.34, 6.01, 6.87. The 6.87 would have to be blocked off while Dan was in the u14s, and a max. of 6.01 would leave Dan very under-geared whilst in the u14s group. Replace just some of the sprocket rings. Not a budget option from our starting point, given the number of rings that would need to change! Replace both front chain rings to give a larger range, and block off the smallest (12 tooth) cog while racing in u14s group. Expensive and possibly ineffective, given juniors don't use their full range of gears most of the time, anyway. NB: Some gear lengths above in parentheses are unlikely to be used, due to Crossover problems.. We haven't discussed the option of putting a triple on the front (not even sure it would fit!). But given youth tend not to use all their gears, and we don't live in a hilly area, it seems unnecessary to consider. The smallest front outer ring we could buy was a 39, and using John's wheel measurement (not Julii's! ), a 39 is just about okay in the under 14s group as long as we block off the 12 cog in the back. It is very uncertain whether Dan will be able to use the 12 sprocket in back in the under 16s (will be very close to exceeding permitted limit). For now we've gone with replacing only Dan's 50 ring with the 39. I read that a front ring of 46 is popular among u16 racers; this allows for no smaller than 15 in the back; this could work okay if the 15 is blocked for u14s and the next rear cog available has 16 teeth. Consider the height of your rider, likely future changes in frame sizes needed. This may affect best solution. Blocking off more than one or two sprocket rings tends to be physically difficult if not impossible. Estimates of the diameter of a "700cc" wheel, with tyre, seem to vary a lot; depend on tyre width & type. Anywhere between 668 & 710mm. But we needed to know precisely for Dan's new cogs to be the right choice, and measure carefully. I did it quickly, and came up with 2185mm circumf, or diam=695.5mm. John remeasured more carefully and came up with 2115m/diam=673.2. White Rose Youth League listing and BC chart of permitted gear ratios. Gear Inch and Shifting Calculator. Sheldon Brown's Gear Ratio calculator. CHAIN RING: Gear/chain rings at the front/on bottom bracket. GEAR LENGTH: How far the bike moves when in a particular gear combination. GEAR RATIO: Number of teeth in front rings x number of teeth in back ring. This "ratio" does not operate like other ratios used in math. Put Gear ratio number into a formula, along with wheel circumference, to calculate Gear Length. GEAR RATIO LIMITS: Simplistically, if you want to keep the first number static (chain ring), you cannot reduce the back number and still say within the permitted limits. If you want to keep the second number (sprocket teeth), cannot increase the first number.